The Hanged Man tarot card symbolizes a conscious retreat from the physical world to follow a higher calling. It could be a spiritual, humanitarian, creative, or other pursuit. On the Tree of Life, The Hanged Man tarot represents the path from rational thinking to an understanding of the divine order. Though the man’s circumstances would appear as reversed (i.e. he is not in control) on the Hanged Man tarot card, he is in the exact position of his choosing – a position of complete surrender. The Hanged Man’s intellect, symbolized by the yellow color of his shoes, hair, and the rope holding him to the cross in the Hanged Man tarot is the tool used to attain higher knowledge. The Hanged Man is dressed in red and blue. When combined, these colors symbolize divine love. Saints often wear these colors in Renaissance and medieval paintings. The Hanged Man’s legs form a cross, just like those of the dancer in The World, symbolizing balance. Unlike the dancer, the Hanged Man’s arms are tucked behind his back, signifying a state of inner balance. Those walking an intensely spiritual path are often admired, but little understood by others. Quite literally, they seem to be living in an upside down world. But the Tau Cross from which the man hangs is an implement of initiation, not execution. Look at the green leaves on the cross bar of the Hanged Man tarot card, the serene expression on the man’s face, and of course, the halo. This is a symbol of life, not death. Yes, the path to enlightenment, ascension and awareness requires intense focus and more often than not, solitude. There is a reason few published authors attend writers groups and Buddhist monks rarely visit New Age fairs. Working writers haven’t suddenly become arrogant, they’re simply too busy living their calling. It’s not that a Buddhist monk looks down on New Age ideas, but they’ve busied themselves with “the work”. They are not just talking about spiritual enlightenment, they are walking down the path and working happily their way through the obstacles placed there. 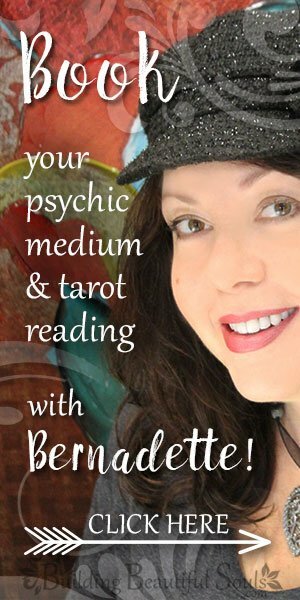 When The Hanged Man tarot card is upright in a reading, it’s a sign you have gained an awareness of your true purpose, and you are committed to pursuing it. Your new-found understanding of the greater, cosmic order has drastically changed your outlook on everything. You no longer have the same priorities as others. In fact, yours may be the exact opposite, the reversal of those around you. This is a path you may need to walk alone. Others may think you have got it all backwards, that you are literally hanging by a thread. But you are not hanging by a thread at all. This is a sturdy rope, and the universe has anchored you firmly to your greater purpose. It will not let you fall, and will not let you fail. What you are experiencing is an initiation, a process transformation in the waters of the cosmic womb. In fact, The Hanged Man tarot is associated with the Element of Water. 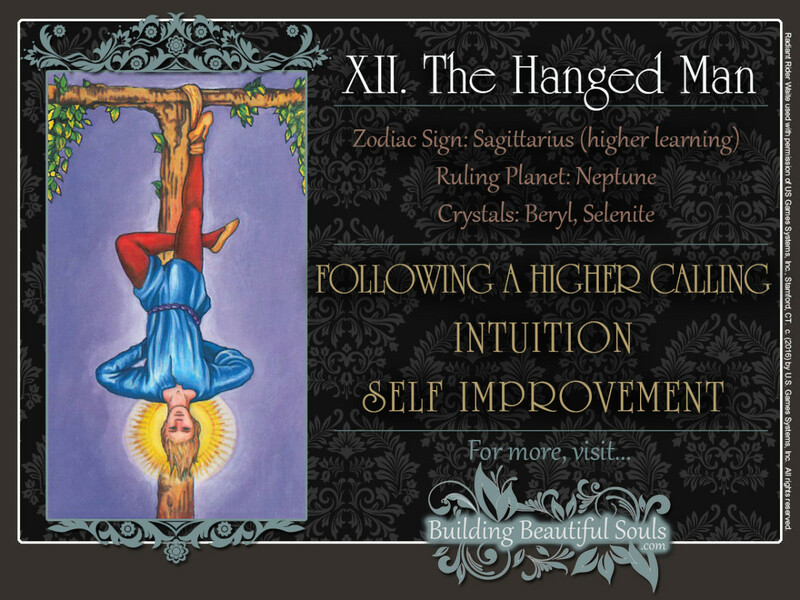 These are the spiritual growth lessons which The Hanged Man tarot brings to you in a reading but messages from spirit can be literal as well. The appearance of The Hanged Man tarot card upright in a tarot reading may be a sign to stall or reverse whatever changes you are contemplating making (career, relationship, finance, etc.). Sometimes the best course of action is to take no action but be perfectly still and “hear” what the Universe is telling you. Reversed or inverted in a tarot reading, The Hanged Man tarot card can mean that your gifts and insights have set you apart from the crowd and sometimes (and ultimately that’s a good thing), you are feeling extremely lonely and isolated. Maybe you are feeling trapped or like you’re not getting anywhere even though you’re working your proverbial tail off. Again, patience is the key: patience with yourself and others. There is a reason the universe has chosen you and no one else to receive the insights and talents it has blessed you with. Although your path may feel lonely, this is not a curse. Accept your gifts. Cherish them. Others will appreciate you for who and what you are in time. In fact, many already do, but from your vantage point, that may be difficult to see. Without your insights and talents, you would not be who you are. If you think that’s a good thing, consider this: You may, in fact, be one of the many people who wish they were you. In this, from a literal standpoint, perhaps The Hanged Man tarot has shown up to let you know that now is not the time to allow your faith or quest for higher knowledge fail or waiver. It’s too important for your own highest and best and that of the world’s. The Hanged Man card is the twelfth Major Arcanum. 12 expresses cosmic or spiritual order. For example, there are 12 signs in the Zodiac and 12 months in the solar year. With all the symbolic references to The World tarot card, it’s interesting to note that 12 is 21 backwards, which reinforces this card’s message of a commitment to a spiritual, rather than a material life. That said, 12 is the Number 3 at but at a higher frequency or vibration.